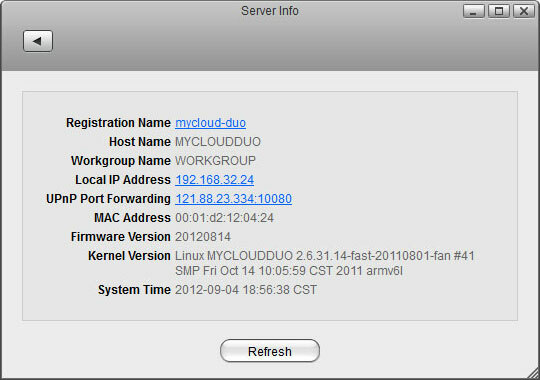 Registration Name The device name used for login via web portal. Host Name The host name of your network drive. Workgroup Name The name of the Workgroup the network drive belongs to (used for the Samba server). Local IP Address The local IP address (LAN) of your network drive. UPnP Port Forwarding The external IP address (WAN) and port number used for remote login to your network drive. MAC Address The MAC Address of your network drive. Firmware Version The current firmware version. Kernel Version The current kernel version of the system. System Time The date and time of the system.